Due to space considerations, Florida Today was not able to include the entire Phil Deaver interview in the printed issue. Here is the full interview, with the full digressive answers in tact. 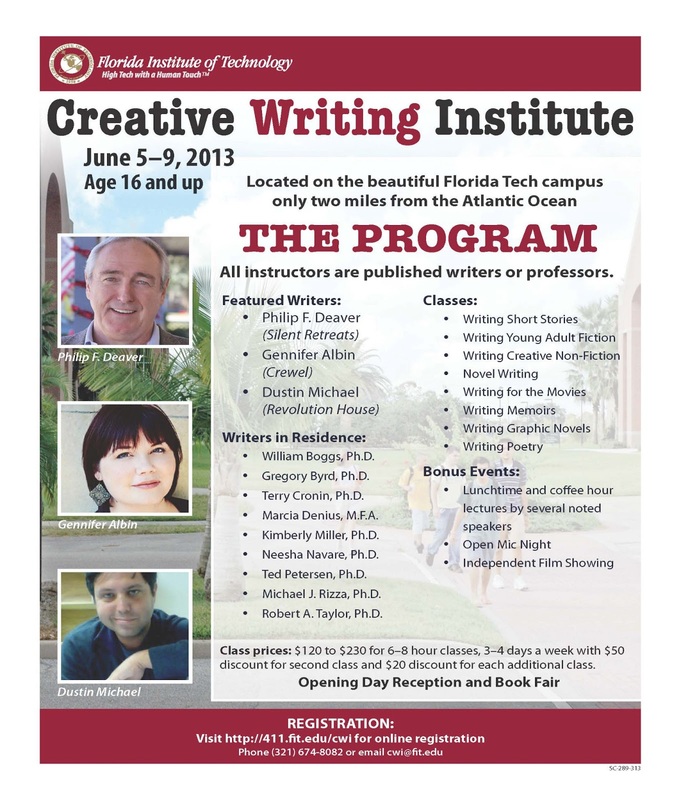 :-) Reminder that that this interview was conducted to promote the great FIT Creative Writing Institute that kicks off Wednesday evening, June 5 and runs to June 9 on the Florida Tech campus in Melbourne. Plenty of space available and you could just show up and sign in! My past, people I know and have known, stories they’ve told me that stick in my mind, feelings I’ve had once I think I have a handle on them. But most of all what inspires me is writing itself, the act of it. For me, the motivation to write arrives separate from what to write. Once I’m writing, what I am going to write about, or who, arrives in about five minutes. Hard to name just one. I like Richard Ford and Ann Beattie and Alice Munro and Geoff Dyer and Robert Stone, Andre Dubus II, Annie Dillard and Karen Russell. My original inspirations were Kurt Vonnegut and Mark Twain and Robert Benchley, followed in my college years by John Updike, John Irving and John Cheever. In poetry Stephen Dunn, Billy Collins, Tony Hoagland, and William Matthews. All these writers have distinctive voices that I know well. I embrace their influence because, having read an awful lot of their work, I think I understand them and their worlds, and as models they represent a high bar for me. The poets expanded my sense of what a poem can be about and the various vectors available. In all of these writers I appreciate how humor and dead seriousness can be joined, blended, to create force and impact. These writers open themselves up on the page. They take risks, reach deep to tell their own truths. It could be said all successful writers do that. No, not really. I deny the very existence of it. If we make up a malady like this and give it a name, next thing you know Pfizer and Abbott Labs will concoct a test to show it’s in our genes and a drug to make it chronic, and then we’re done. A few years ago I borrowed a cabin in the North Carolina mountains. A friend of mine came up to visit, and on the first day, we ran a road along a mountain ridge. He only tried it once, and his reason for not going on that run anymore was that the hills got him out of breath. I told him that’s what hills are for on a run, and that the more one does it, the better it gets. Writing also is very hard. We do it anyway. Rather than not doing it and giving a name to why we don’t. You edited Scoring from Second, so you must be a fan of America's favorite sport. How do baseball and writing connect? I am certainly a fan, though I’m not sure it’s really the favorite sport of America anymore. I can only answer your question in personal terms, how I as a writer connect with the game. I played a lot of baseball growing up. Many initiations into adult realities first made themselves known to me in baseball. For instance, the personality types I encountered among teenagers in baseball were similar and in full bloom during the twelve years I spent in a consulting firm. The last organized baseball game I played in was an over 50s league here Orlando. I’d coached my own kids in baseball when they started, and this was the first time they, as young men, got a chance to see me play an actual game among other experienced players my age. I was playing center field because I couldn’t seem to break into the infield (where I’d played in the past). A fly ball was hit to me, and I had to run in for it. It wasn’t a problem, it was straight to me, just a little short so I had to run in. At the moment the ball hit my glove, another player, another fielder on my own team, shot by me going for the same ball and knocked it out of my glove. I was conscious of my kids watching their dad, from the fence over by first base. When the inning was over, as I was jogging past them to the dugout, I rolled my eyes at the idiot who’d knocked the ball out of my glove. My oldest son said, “Dad, you have to call for it.” This was something I’d told them over and over when I was teaching them the game. If there’s anybody out there who can imagine the complex wave of feelings I had right then, that person will also know how I can make stories and find inspiration from the game. Do any of the characters you've created keep coming back for more stories? Are there some characters who are just too good to let go? A very insightful question. Sometime a character appears in a story and “owns” that story and that one alone. Probably won’t be resurrected in subsequent stories. I have a story collection, Silent Retreats, from long ago, and in recent years I’ve written a novel, Past Tense (unpublished), that weaves most of the characters in those stories into novel form. In that case, I took pleasure in preserving and extending characters I’d created, pushing them on into the next phases of life as I myself pass through the phases. How do you see social media affecting the business of writing? 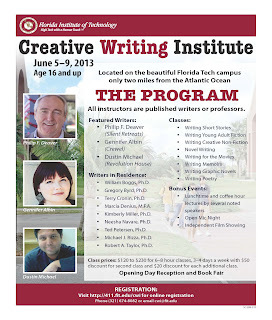 The business of writing is changing by the day, literally. I’m not sure social media is why, unless you call the internet, Amazon, and the fact that there are fewer people reading than writing issues connected to social media. Some people will think these new changes are “opportunities,” rather than “deterioration.” A baseball metaphor perhaps: What if everyone decided it was more fun to play baseball than to watch it. It would suddenly become a business to provide everyone with the opportunity. Everyone would either play a computer game called baseball or they’d go to the ballpark on Sunday afternoon, and upon arrival they’d be issued authentic Yankees and Cardinal or Red Sox uniforms and equipment, fancy gloves, bats, and spikes, and be allowed to trot triumphantly onto the field. Using digital video, a baseball crowd would welcome them with digital applause. They could play anywhere they want, which means there’d be many pitchers in the middle of the diamond, but no catchers so we could have a digital catcher. Everyone would want to be a star and get paid a lot. There would be no more major league baseball, just like one of these days there will be no more Chicago Tribune, Scribner’s or Norton. If you could describe yourself in terms of a fictional character, who would that be?